Know more about Calicut University online degree registration 2013-14. Do you want to known Calicut University centralised ranking from official website www.uoc.ac.in/ugsw/? Do you wish to check Calicut University trial allotment list/results 2013? Students who had submitted their applications for various degree (PG/UG) courses under the University can go through the trial allotment result which is currently published at the official website. With the Calicut University online degree registration 2013-14 process completed, the trial allotment result has been published at the official website. Those students who had submitted their applications for various degree (PG/UG) courses under the University can now go through the official website to get their results. Trough the trial allotment process, students can identify their chance of getting degree admission in the Calicut University. Necessary corrections should be made in the application on or before the stipulated time. As no correction can be made after the prescribed date, students must take care to make changes before the stipulated time. The Calicut University will publish the first allotment list/ rank list 2013 in the last week of June. Later a second and third allotment list will be published and the students would be called for an interview. Calicut University centralized ranking process (CRP) online degree registration ended and the first allotment list/result is published. 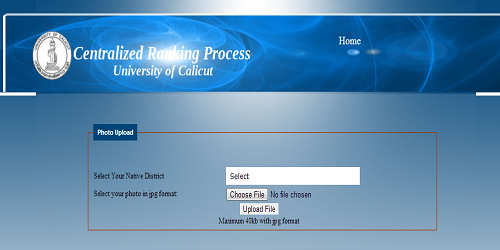 Provisional rank card of Calicut University centralized ranking process 2013 is currently available on the official website. Read here for more instructions about single window allotment system for the academic year 2013-2014 and interview of CRP degree admission procedure at Calicut University. Do you want to know about the final allotment rank list/result 2013 of university of Calicut? Calicut University Centralized ranking process (CRP) final allotment list/result publication has been postponed to June 28 due to mistakes in rank list. Candidates who had applied for various degree courses (PG/UG) in Calicut University for the academic year 2013-2014 can check their final allotment result on June 28 at the official website www.uoc.ac.in/ugsw/.